For those who believe gold is the ultimate arbitrator of value, its ratio to different commodities serves as an essential tool of trade. In India, it hearkens through millennia via the tradition of barter and seek, “How many ounces of silver buys an ounce of gold?” Today, this question is answered when the currency-denominated price of gold is divided by the price of silver. The resulting ratio removes currency from value comparison which is desirable given the current instability of fiat money in global markets. For the case of gold and silver which typically share the same scale, the ratio also removes the unit of weight measurement (e.g. troy ounce or grams). A gold-to-silver ratio of 50 represents the same relative value to a precious metal trader in the Western world (U.S. dollars per troy ounce) as to a trader in India (Indian rupees per gram). My colleague, Sumeru Salla, is an active trader of gold and silver in Mumbai, India and we have together developed a broader method for determining the value of gold for our two parts of the globe. The objective is to create a robust measure to influence trading strategies for each respective region. A comparison of these regional measures reveals subtle second-order valuation differences between global markets and exchanges and one currently large anomaly. Silver is both a precious and industrial metal now competing with gold for investment and as a hedge against fiat currencies. The GVI is assigned a dimensionless value of 100 for June 7, 2010 when the Dow closed below the intraday low of the so-called “Flash Crash” of May 6, 2010. On that day, the GVI represents a “high-value” for gold relative to those three commodities. 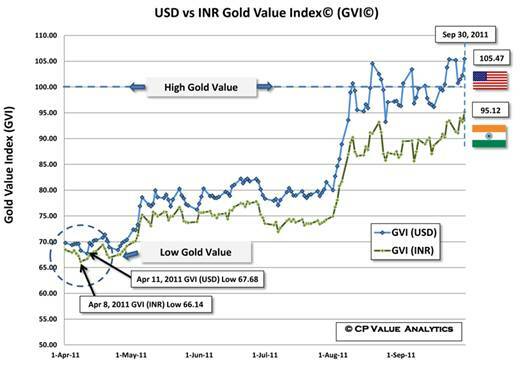 The GVI concept is extended to Indian markets to establish two indices for comparison: a U.S. domestic Gold Value Index derived from commodities denominated in U.S. dollars, called USD GVI, and an Indian Gold Value Index, called INR GVI, based on a similar basket denominated in Indian rupees. Table-1 summarizes each of the GVI components and the respective market exchange for each component price. *Multi Commodity Exchange of India Ltd.
For the oil component, Nymex West Texas Intermediate, also known as light sweet crude, was selected as the benchmark for the U.S. domestic GVI and ICE Brent crude for India since they primarily rely on high-sulfur crude oil. Brent, although listed on the MCX, is an illiquid contract. Therefore, the ICE exchange price has been converted by the prevalent USD-INR rate. Since June 7, 2010 was also a calamitous day for eastern markets as well, the INR GVI is assigned a value of 100 equal to the USD GVI for that day. Nov. 26, 2010 is the first important milestone for comparing the USD and INR indices. This date lies roughly in the middle of a six-week interval when key commodity ratios returned to near historical norms and enjoyed a brief period of stability; a time of calm after the commodity churn of the 2008-2009 financial crisis and the reflation of 2010, and preceding the commodity inflation of late-2010 through mid-2011. The USD and INR GVI had nearly equivalent values on that November day; 83.56 and 83.61 respectively – a difference of only 0.07%. The two indices started diverging in 2011 with the growing inflationary effects of the second U.S. quantitative easing and the oil spikes of “Arab Spring.” Here is a chart of both GVIs from April 1 through Friday. By early April 2011, gold lost considerable value compared to June 2010. The copper price peak in February accelerated the initial value erosion, then rising oil and silver prices in April drove the USD GVI (blue line) to this year's low of 67.68 on April 11; the INR GVI (green line) fell to 66.14 on April 8. The difference between the two indices became more pronounced as Libyan oil came offline. By April 11, the Brent-WTI spread was nearly $14/bbl and is presently over $20/bbl. Gold’s value rose after the dramatic drop in silver prices following a record high in late April. After a May-June malaise in metal prices, it appeared that the GVI for both regions was stabilizing for a second period of calm in late July. Stability was short lived with the onset of the debt ceiling debacle in the U.S., ensuing credit downgrade and markedly worsening sovereign debt issues in Europe. By August, the US GVI shot up to the high gold value levels of June 7, 2010 and has bounced with great volatility around the 100-level since. (Ref: Why is Gold More Volatile than Copper, Oil or Silver?). The INR GVI too gained traction but never made it back to par-value, gyrating around the 90-level instead, held back in value primarily by the growing difference in the oil benchmarks. Both the USD and INR GVIs marked record highs of 105.47 and 95.12 at the third quarter’s close on Friday. Both indices fell to a roughly 20% discount to their market norms in April. 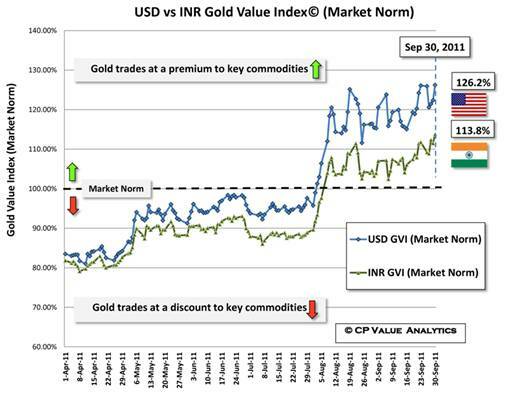 The USD GVI is presently fluctuating around a 19% average premium to its norm; the INR GVI, about 7%. Friday’s closing numbers are record premiums of 126.2% (USD) and 113.8% (INR). It can be a good time to buy gold at the bottom of a gold value cycle when its price and value are ready to rise together. My Aug. 22 Kitco commentary describes how two renowned commodity traders bought gold within a day of each other (April 20-21) shortly after the USD GVI low (April 11). Importantly, both are often openly skeptical of gold seeking greater rewards elsewhere in the commodity space. The flip-side: It should make equal sense to buy copper and oil when gold is at the top of the value cycle and there is some evidence that the prices of the red metal and oil are poised to recover. On Sept. 6, with the GVI above the 100 high-value mark, one of the above traders announced intentions to buy both. Regarding regional trading strategies, the divergence of the two gold value indices suggests different entry points in and out of gold positions or on the flip-side, copper and oil. Sumeru is working on an INR Silver Value Index to refine silver trading decisions in India - the preliminary result supports the regional approach to relative valuation. Oil benchmark divergence is the obvious explanation for the USD/INR “value gap,” but there are subtle nuances for copper and silver, too. To examine this, the gold-referenced ratio of each GVI component was differenced and normalized to the USD ratio as a percentage. The statistics of this difference are shown in Table-2. There are small biases for both silver (Au:Ag) and copper (Au:Cu) deltas with comparable standard deviations (<2%). These differences may be due to second order currency exchange effects, time skew and/or other market exchange nuances worthy of further study. By contrast, the ratio differences due to different oil benchmarks (Au:Oil delta) are pronounced with a nearly 16% negative bias and a standard deviation exceeding 5%. According to Indian refiners, the oil market difference is not permanent and could easily reverse. Recently Morgan Stanley reduced their 2012 price expectation for Brent crude from $130 to $100 on the prospect of supplies returning from Libya and the North Sea and weaker global demand. Skeptics may say an oil market anomaly shouldn’t affect the true value of gold on either side of the globe. Notionally, given the same automobile, an ounce of Indian gold today doesn’t get you as far down the road as an ounce in the U.S. The WTI-Brent spread may indicate a greater U.S. economic contraction versus developing nations who have higher inflation and elevated gold prices denominated in their sovereign currencies. A dimensionless metric that captures the same power as the gold-to-silver ratio in communicating relative value across national boundaries, sovereign currencies and weight conventions. A valuable tool for making trading and investment decisions local to a region. The bottoms and tops of commodity-based gold value cycles herald decisions to buy gold (bottom-cycle) or the component commodities of the index (top-cycle) when expectations align for a rise in value and price of either. Comparison of regional indices reveals value sensitivities to occasional region-to-region market disruptions/dislocations and more subtle differences in day-to-day marketplace temporal skew and second-order currency influences. In closing, the old adage that opportunity lies in market differences hopefully inspires the reader to imagine creative possibilities given the present gold value arbitrage across continents. Disclaimer: The prices of precious metals and physical commodities are unpredictable and volatile. There is a substantial degree of a risk of loss in all trading.